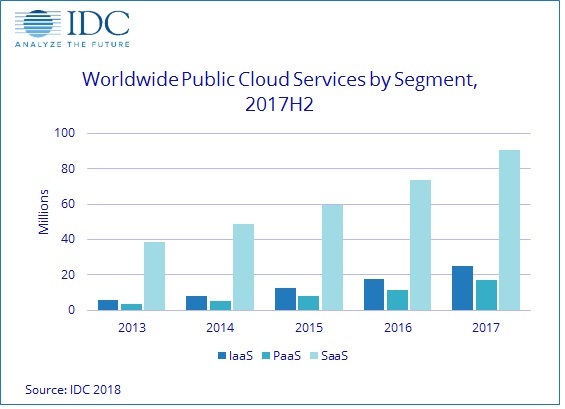 FRAMINGHAM, Mass., June 22, 2018 – The worldwide public cloud services market grew 29% in 2017, reaching a total of $117 billion, according to results from the 2H 2017 release of the International Data Corporation (IDC) Worldwide Semiannual Public Cloud Services Tracker. While the overall growth rate in 2017 was marginally lower than 2016, revenue growth of the top 16 providers (by market share) increased during this period, continuing their market share dominance in the public cloud services market. Their cumulative share of the market went from 47.9% in 2016 to 50.7% in 2017, accounting for just over half of all the worldwide public cloud services spending. From a regional perspective, the United States continues to provide a majority of public cloud services revenue. The global share represented by the U.S. saw a slight decrease in 2017, going from 62% to 60% as adoption and growth in other regions increased their contribution to the worldwide market. IDC expects this trend to continue through the next few years, as new regional services and expansion by global players become increasingly strong factors driving global growth. The Software as a Service (SaaS) segment was characterized by supplier consolidation, maturing customer adoption, and steady growth. Enterprise Resource Management (ERM), Customer Relationship Management (CRM), and Collaboration applications contributed the most to SaaS growth, accounting for 64% of all SaaS-delivered applications. Supply Chain Management (SCM) and Content applications represent the fastest growing categories of SaaS applications at 27% and 28% respectively in 2017.